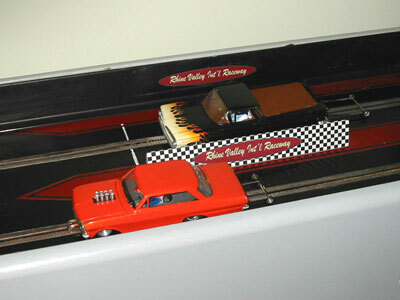 Our 1:24 scale racetrack offers ample power and traction for even the fastest G7-Funny Cars. 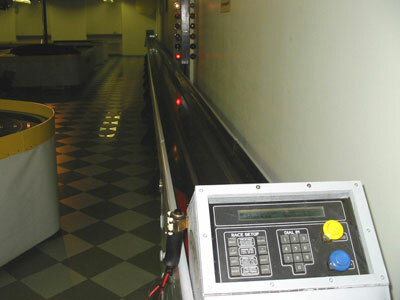 The reaction time at the starting line is often the deciding factor in the outcome of a drag race. 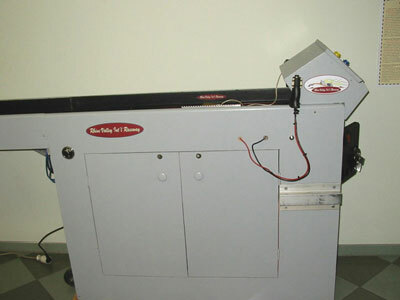 The starting line cabinet that holds the battery/ power supply and the electronics for the coin operation and the Trick Trax computer. A look at the Christmas Tree and towards the finish line. The Rhine Valley Int´l Raceway is the first slot-dragtrack in the Lake Constance region and one of only a handful wooden dragtracks in Europe. We use specially chassied 1:24 and 1:25-scale cars with either lexan or hardplastik bodies in several racing classes. The racing distance is approx. 13m long (= a 1000ft racetrack) with an additional shutdown area of 5,5m to slow the cars down. 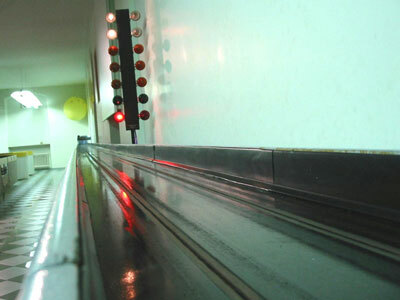 The visitors can use their own vehicles or our rental cars to race against their (or with) others and test their reaction times. Conveniently located in the Karacho-Slotcenter, we also provide our knowledgeable advice and everything you need to get started in scale drag racing - from parts and kits to new or used ready-to-race cars. Besides the dragtrack, the Karacho-Slotcenter offers 3 1:32-scale Carrera-racetracks to race on, as well as snacks and drinks and ample room and tables to just sit down and relax.